February | 2014 | Come Route With Me! I’ve been begging random Cisco folks that I meet for a copy of XRv, XR4U,CML, VIRL for a while now… it hasn’t worked very well… at all. This month Cisco has finally released XRv though, so now I have a new toy to play with! I’m not 100% sure what entitlements are required to be able to download this, but I was able to successfully download it sometime last week. 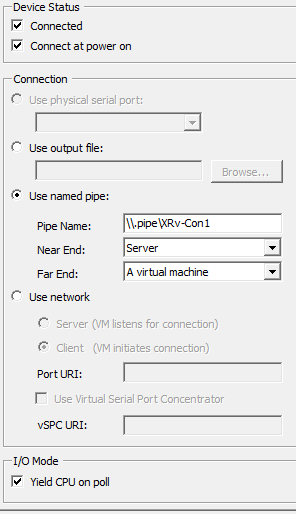 In the above pic you can see that this serial port is basically configured with a named pipe, that this end, the “near” end, is a server (our XRv device), and the far end of the pipe goes to another virtual machine. The other virtual machine in my case is just a simple Ubuntu box with a serial port that is configured in the reverse of the above. In the Ubuntu VM I used screen to pop onto the TTY: “screen /dev/tty.S0” — I’m sure there are better/different ways to do that, but that worked for me. In the above snippet, obviously enter whatever domain name you would like, the final line there is an exec level config — ‘SSH’ is just a name for the key pair. If you are not used to IOS-XR — you will have to remember to ‘commit’ changes that you make, luckily for you IOS-XR will do a pretty good job of barking at you to telling you that you forgot to do so! So now that I’ve got this nifty XRv device humming along whats the deal. To answer that lest back up from the technical stuff for a bit. So whats the point of XRv? For me, the best part is that I can now lab some seriously cool and complex stuff that you just can’t do in GNS3. I’m sure that’s a nice plus for Cisco too, but that doesn’t make them much/any money (perhaps they will do a “study” license in future releases or more likely they will just do that with CML as has been discussed), and doesn’t really and any value/benefits for their customers. I think more importantly (to Cisco at least) than the training/CML use case is the ability to use this as a virtual route reflector. Consider that in many scenarios route-reflectors are usually nothing more than a device with a bunch of memory to handle big routing tables and occasionally send them out when a client router goes offline and comes back up. That router isn’t actually in the transit path for any customer traffic at all, it’s just there to keep the tables and hand them out as needed. There is basically zero good reason to have that on an expensive ‘five nines’ physical router. Why not use XRv to leverage existing virtual environments, I’m assuming (not 100% sure but don’t see why not) it can be vMotion’d to allow for maintenance of the physical hosts; that’s surely a lot cheaper than buying two physical routers for redundancy, or loading up routers with multiple RPs etc. I really like this idea, and in fact have a customer right now that could really benefit from this type of flexibility. Anyway, enough with that, lets see what I’ve found that works and doesn’t work so far. OSFP; haven’t done a bunch yet, but everything I’ve poked seems to work so I don’t see why there would be anything not working here. Obviously it can be bridged into physical networks no problem. There was a thread somewhere that said that ESXi only supports up to 10 vNICs per host but XRv supports up to … some very high number. I’m not sure about either of those facts, but they sound legit! Though I think that’s mostly irrelevant for the ‘real world’ potential use case of route-reflection, and also probably not that big of a deal for lab too. RSVP; its configurable without screaming at me… seems like a good start. BFD, don’t get any sessions to come up in OSPF… can try more later. L3 VPN — since it looks like everything required to do this work, can’t imagine it won’t work. CDP to physical stuff; network in ESXi is in promiscuous and all that fun stuff… CDP in GNS3 works in this fashion so this may warrant a bit more exploration. CDP between two XRv instances doesn’t appear to be working either. I would have thought this would work, but that may be due to the ESXi config stuff. That’s all I’ve got for now. Bottom line is that XRv is pretty slick and I’m glad to finally have my hands on it. At this point I don’t think its a viable replacement for rack rentals/physical gear for CCIE SP lab use, but it certainly won’t hurt. I plan to try and write some more about XRv at some point hopefully soonish (but I’ve planned to write more about the DMVPN/BGP post too…. see how that’s working for me).